Has a Traumatic Brain Injury rocked your life and your financial future? Collect Traumatic Brain Injury Disability Benefits. A traumatic brain injury (TBI) usually occurs when the head is hit with such force that damage occurs to the brain. It can be caused by car accidents, sports activities or a simple fall. No two brain injuries are alike and consequences vary. Some people sustain a “mild” brain injury which can cause headaches, difficulty thinking, memory problems, and mood swings. Other people suffer a “severe” brain injury which can cause limited functions of arms and legs, abnormal speech, emotional problems, and seizures. Whether you have a “mild” or a “severe” traumatic brain injury, the impact can be devastating and your future uncertain – especially if you can no longer work, pay bills and support your family. If you have a Traumatic Brain Injury and have been (or are expected to be) out of work for at least 12 months, you could be eligible for Social Security Disability benefits. Filing or appealing a disability claim can be complicated and overwhelming – and isn’t something you should tackle alone. Let the disability team at McDonald Law Firm handle everything for you. Qualifying for Traumatic Brain Injury Disability Benefits is more than just filling out a form. If you meet one of these disabling conditions, there’s a good chance you’ll be quickly approved for Social Security Disability benefits. Improve your chances of obtaining Traumatic Brain Injury Disability Benefits. Evidence is essential. While your approval chances greatly improve with powerful medical records and evidence, we realize it’s a lot of work to gather and submit these documents. Leave that to us. 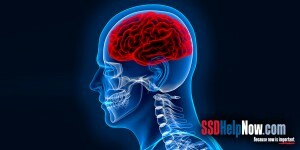 The skilled staff at SSDHelpNow.com will prepare all the necessary files, documents and paperwork. Denied Traumatic Brain Injury Disability Benefits? Don’t panic. It’s not unusual for the SSA to deny Social Security Disability benefits the first time around. In fact, it happens more times than not. The good news is that you can appeal and, with an experienced disability attorney, you’ve got a good chance of winning. Don’t procrastinate. You only have 60 days to file an appeal. Hiring a lawyer could mean the difference between collecting Social Security Disability benefits and not. The disability team at McDonald Law Firm know what evidence you need and how to prove your claim. Not to mention, hiring us won’t cost you a penny up-front. We don’t get paid unless we win your case. Even then, our fees are set by the federal government. The amount is either 25 percent of your past due Social Security Disability payments, or $6,000, whichever is less. There’s no reason not to get started today. Call us at 877-568-8413.